Brandy Rainey is a native Texas. She has produced twelve narrative short films with a wide range of budgets and written and directed eight short films. She is renowned f or completing her projects on budget and on time. Brandy likes to use film to entertain the audiences. What motivates Brandy is the deep desire to tell stories that are unique and powerful, while engaging the audience in a world that is outside of their experience. She prefers subjects you would be struck with as dramatic, character driven, with action and provocative situations and resolutions. Brandy would like to be known for creating beautiful, engaging, stories of our human existence. Brandy Rainey is a leader in the Austin film community and serves on the Board of Directors for Reel Women, a non-profit organization that supports women and others in film. She has been instrumental in building The Film Network, which is another local organization that brings actors and production teams together. She serves as the lead for the Bootstrap Austin Film Subgroup, which is a group of entrepreneurs exploring filmmaking using a Bootstrap approach. She is also a member of the Austin Film Society and the Texas Motion Picture Alliance. Brandy Rainey has spent the past several years building relationships with key industry professionals to fulfill on her dream of being a successful film director that helps others in the film industry have their dreams realized. She owns her own production company: Set It Off! Productions, which is expanding to Strapped Entertainment. Steve Barcik bought his first film book at ten and became fascinated with the art form. Later, he began making short films, hooked by the audience reaction; he found the best part of the process was working with so many dedicated, talented people. He says the most wonderful times of his life were when he was on set during production. Steve has written, directed, and/or produced many short films and concert/music video over the past 6 years. His projects have screened at MAFIA, Nudge Fest (Award), Reel Women at SXSW and METV. Steve is currently collaborating on features in development and production. Paul Bhatia is a small business owner and amateur filmmaker in Austin, Texas. Matt Bizer is a passionate, talented Cinematographer/Filmmaker. As a cinematographer and filmmaker, he wishes nothing more than to tell stories, and to help others tell their own stories – and tell them beautifully. He feels that there is nothing more inspiring than the collaborative and organic project, and it really shows in working with him. He is willing to do whatever it takes to get the shot. Matt owns Willow Productions, a full-service film, TV, and web production firm. Marian Bingaman has dedicated the last 10 years to film and video production with a background in television production, short film and independent film. Her own independent short film has been broadcast on Public Television. Her diverse experiences include directing, assistant directing, script and continuity supervising, to camera and editing making her an asset to our production team. Garret Gray was born to Immigrant Italian parents; he grew up in the tough streets of Hoboken, New Jersey doing what he could for a living. One day at 8 years old while rifling for food on a winter day, an old man put an 8mm camera in his hands and quickly fled away into the snow. Ever since, Garret has been unable to put the camera down or tear himself away from that inescapable vision that cold January day. Whether 8mm or high definition video. His career has taken him to Austin, Texas where he currently works and looks upon the old 8mm camera with fond memories and as an inspiration of dreams to come. Ok, the real one is this: As a graduate of FSU Film School, his career has landed him in many cities around the country. 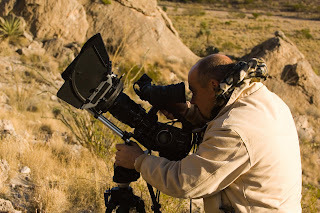 He’s worked on projects as a camera and lighting guy from New York to Miami and Washington State to Texas. Currently he makes his home in Austin where he wearsmany hats on the film set and has come to be a part of the music scene by filming bands, videos, and concerts while also working with on-location sound from time to time. Tom Zinn started his photography career at the tender age of four in the serene farmland of Minnesota. His earliest subjects were cows, goats and tractors but he eventually included human subjects. Tom has been a full time photographer working for the last nine years, traveling the United States, South Pacific, Europe and Africa, proudly published in a variety of books and other publications ranging from The New York Times to the Rob Report. His portfolio spans a diverse client list such as BMW and Dell Computers; events such as the America’s Cup, Austin City Limits Music Festival, SXSW plus other extreme sports, fashion and travel assignments. “Tom’s photographic portfolio not only shows his considerable technical skills but his artistic ones as well…you owe it to yourself to see Zinn’s powerful photography.” – Joe Farace, Shutterbug Magazine, October 2000.